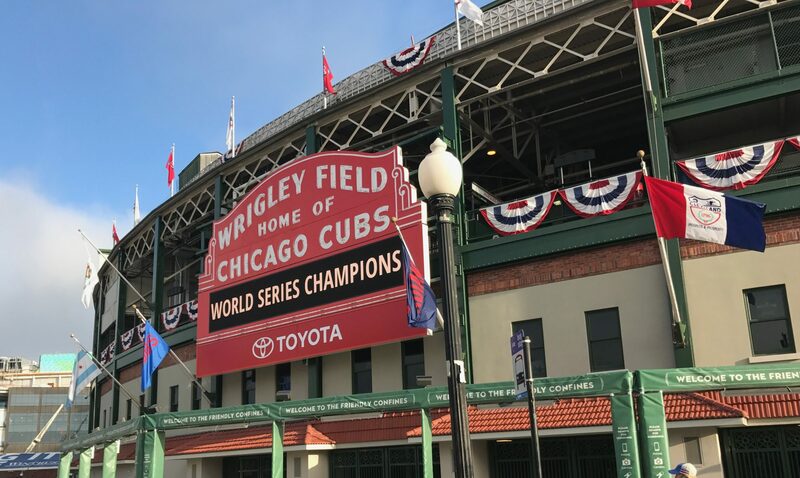 The Art Director of Nuveen Investment’s PR company (Fallon) contacted me a few months ago via e-mail asking if I’d be willing to let Nuveen use a photo I took at Wrigley Field last August for a print ad. The photo was uploaded into my Flickr account and was well-tagged. I license all of my photos with a Creative Commons attribution non-commercial license, meaning that anyone is free to use the image with attribution, except for commercial purposes (I since changed this particular photo to all-rights-reserved to make it even more clear that I wasn’t willing to give it away to Nuveen). Although I suspect the photo has been on display since the beginning of the season (I’m told it is one of eight on display in the entry way of the skybox area near the ticket booth) I was finally notified today of its use and agreed to terms to license it for the rest of the season. I must say I’m very happy to report that the Creative Commons system works, I’ve made money from shooting a photo that was discovered on Flickr and never expected to, and even though the ad is pretty stupid, at least it’s not above the communal urinal in the men’s room. An interesting aside, the original photo was in color and was taken during the Chicago Air & Water Show. The jet pictured in the original was rubbed out for the ad. UPDATE It’s 6p.m. PDT and it is NOW possible to upload videos (for Flickr PRO account holders). My question is, will it accept video uploads via e-mail, i.e. directly from a camera phone? Let’s see. Hopefully this will be live later today (as rumored)!